Miles Roby is, in a lot of ways, living the life I always feared. Although he tried to get out of his small town in Maine and make something of himself, when his mother got sick he dropped out of college and moved back home. 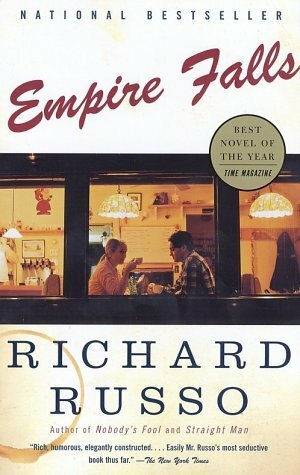 Ever since then he's been working at the Empire Grill hoping that someday when the owner dies it will be his. He's in the middle of a divorce from a woman who cheated on him with a much older man who enjoys coming into the Grill and challenging Miles to arm wrestling. He is still hopelessly in love with a waitress he's known since high school and has no more of a chance with her now than he ever did. He worries about his daughter, worries about his father, worries about his brother. He is regularly harassed by a cop who seems to think they should be friends and that Miles has somehow wronged him. He is the unwilling object of affection of a disabled woman who has always been in love with him and has tried to commit suicide over him. Inconveniently, it is her mother for whom Miles works and, coincidentally or not, for whom Miles' mother also worked. He is stuck in a life that isn't what he had planned, is not what he wants for himself, and he's not very happy. But Miles is also incredibly endearing and his problems have all come about despite, or possibly because of, his repeated attempts to do the right thing. Just as interesting and complex as Miles are his ex-wife Janine and daughter Tick. Janine wasn't quite as likable as Miles, but I found her intriguing and complicated. Meanwhile, Tick faces her own struggles at school where she tries reaching out to John Voss, an ostracized secretive student possibly hiding some mysterious goings-on at home. She was a little heartbreaking, equally earnest and sullen, and I really wanted everything to turn out well for her. At its core, Empire Falls is about how the choices people make in an effort to escape their destinies can be the very choices that trap them in the end. No matter how hard he tried, Miles could not escape the Whiting family, nor could John Voss escape his inner demons. Watching both of their stories unfold so differently was a fascinating study of human nature. Experiencing it from such a talented storyteller was a treat. The slow detailed pace of the novel was neither plodding nor boring, but rather like a meandering walk on a pleasant day with interesting company. I appreciated the opportunity to get to know the characters so intimately and share in their lives, and they were quite a colorful cast. Russo's humor also hit the mark: "Earlier that year when Janine had suggested that she take some modeling classes, Tick had sneered that maybe she would, after her lobotomy. Which had pissed Janine off even before she looked up the word 'lobotomy'." I have a soft spot for anything Maine, and this town and its inhabitants were recognizable and authentic. How nice it would to drop by the Empire Grill the next time I'm in the area, if only it actually existed. This book sounds fantastic. Great review, Linda. It's funny. When I finished it I thought it was good, not great. But I kept thinking about it, and the more I think about it the more I like it.